Losing weight can be a daunting task, especially if you are an obese person like me. However, it isn’t an impossible thing to do and if I can lose 27.5kg (from the peak and 13kg in last 3 months), you too can lose weight easily, while becoming healthier than ever before. For any effective weight loss program, here are 5 essential things you need. 1. Determination/Will: This is the most critical one. If you aren’t determined to lose weight, then let’s face it, you won’t be successful in your endeavor. Because losing weight not only requires you to resist temptation of comfort food, but also requires you to shed your laziness and workout. So make sure to come up with a good goal/motivation, which keeps you motivated in the long term and leads to a healthier lifestyle. 2. Calorie counting App: There is a famous saying, “six pack abs are made in kitchen.” A weight loss program cannot succeed, if you do not monitor what and how much you eat. So calorie counting apps like My Fitness Pal can not only help you keep track of your daily calorie intake, but also macronutrients. Remember, losing weight and getting healthier isn’t about starving yourself. Rather it is about making right nutrition choices and eating food which is healthier for your body and helps you meet daily caloric and macronutrient requirement. 3. Kitchen scale: A crucial part of dieting is portion control i.e. not only eating right food, but also eating it in right quantity. Since we are used to eating large portions of food, it is extremely difficult to know the right amount of food you should be eating (especially in the beginning). This is where kitchen scales come in. You can measure uncooked food to accurately determine the amount of calories, protein, carbs and fats that you are consuming each day (with the help of calorie counting apps). So make sure to measure your food, before you cook your meal and you will start noticing a difference right away. I use a digital kitchen scale daily to measure my food, before cooking. 4. Weighing scale and measuring tape: Best way to keep yourself motivated is by logging your progress on a weekly basis. So make sure to measure your weight as well as take measurements of your waist, chest, hips, thighs, biceps etc. each week. This will help you keep track of your progress and keep you motivated towards your goal. Just remember not to lose heart, in case you do not see any changes in measurement or weight for a week or two. If you do not see any change for couple of weeks or more, then tweak your diet and exercise plan slightly and your weight loss journey should be back on track. I use a Chinese made digital weighing scale (like this one), since it is easier to read than a manual weighing scale. While the above things will help you in your weight loss journey, at the end of the day, it is up to you and your willpower, which will ultimately make a difference. So make sure to read nutrition and workout articles from trusted sources and aim to not only lose weight, but also improve your health. 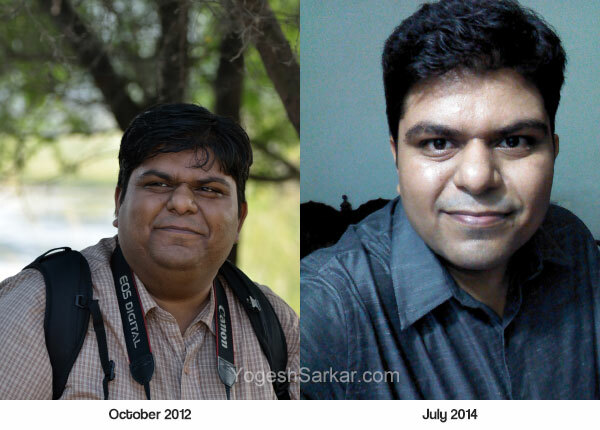 YS: Weight loss ke naam par, Ek meet to banti hai..
Prashant, we don’t need an excuse for a meet :). good show bro… impressed.. i was 106 when came back to India and now 88kgs … yes.. big part on AAP volunteering but yes as per height i shouldn’t be more than 84 .. for need to reduce 4-5 kgs more.. looking forward for GM Diet Plan. Thanks for sharing these tips…Can you please let me know your regime like what all exercises you do and for how long? Ramit, at the moment I do 80 minute walk (40 minutes in morning, 20 minutes before the workout and then 20 minutes after workout) each day. I do few bullworker exercises 7 days a week (takes less than 10 minutes). Chest: Resistance band chest press, fly and chest pull down. Back: Barbell row, one arm dumbbell row, resistance band lat pull down and stiff leg deadlift. Triceps: Dips, one arm triceps extension and resistance band triceps pull down. Shoulders: Seated dumbbell press, lateral raise, side raise and front plate raise. Side bends and shrugs to finish off the workout. Biceps: Barbell curl, dumbbell one arm curl, hammer curl and resistance band curls. Legs: 10 sets of squats (without weight, since I am still fixing my core and back) and 10 sets of calf raise. Apart from legs, I do 5 sets of each exercise and any where from 6 to 14reps. Whoa! Congratulations. You were always amazing but the slimmer look is great. What is your schedule going to be to keep to the ideal weight? Thanks Asmita. I haven’t yet achieved my ideal weight, I have to lose about as much as I have lost already, in order to reach around that goal.